I've often been accused of being an "old soul". I shouldn't even say "accused", I suppose, because I embrace the title. I enjoy things from simpler times. From music, to art, to lifestyle, I enjoy simply and "tried and true". I'm a traditionalist, too often steeped in a sense of nostalgia. Of course, this trait comes out quite often in cooking or baking. I'm drawn to old recipes. Simple ones. Thus, there is nothing more treasured in my recipe library than the recipes handed down from my Nana Virzi. She passed away a year or so after my wedding, but she lives on in these recipes. There's a back story here, and a box of hundreds of recipes, but that story, it's not for today. Today, I would like to talk of cheesecake. A couple of years back, I asked my Aunt Claudette to send me what she had of my grandmother's recipes. In the mail, I received photocopies. Recipes, written in my Nana's handwriting, and the letter that originally accompanied my aunt's request for the knowledge. They're beautiful. I treasure them. 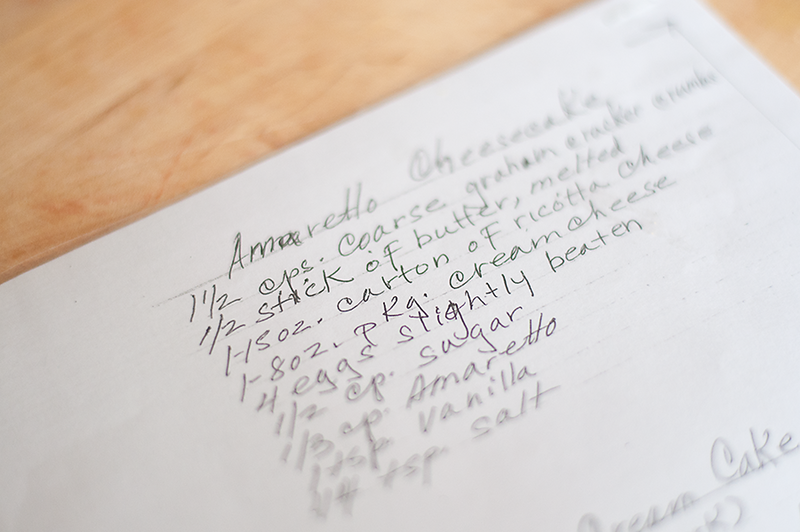 Among the ones sent, was a recipe for Amaretto Cheesecake. 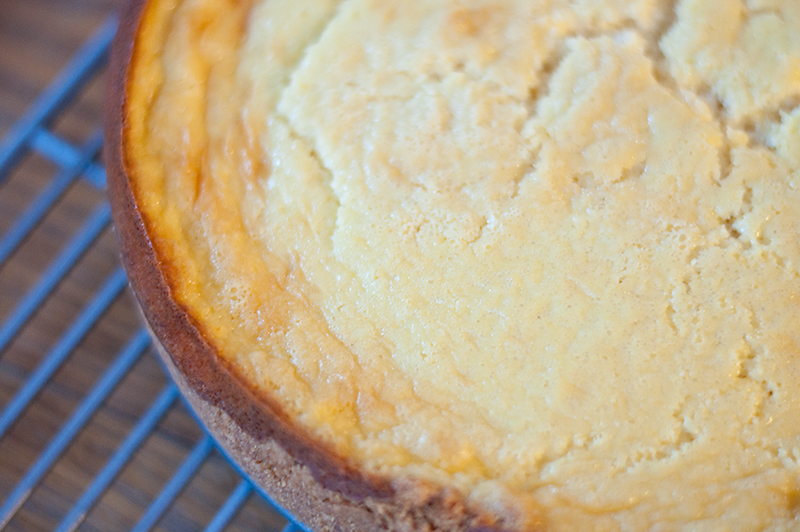 Thus, when I saw that this month's Bake Together (brought to us by the lovely Abby Dodge) was cheesecake, I knew I had to finally make this recipe. It's simple, unfussy, and I can envision my Nana serving it at a dinner party. It's a little taste of a time gone by. 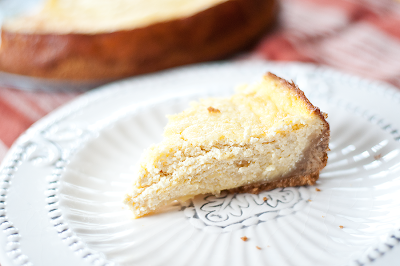 Ricotta is added in this cheesecake, making it closer to ricotta pie than tradition cheesecake. 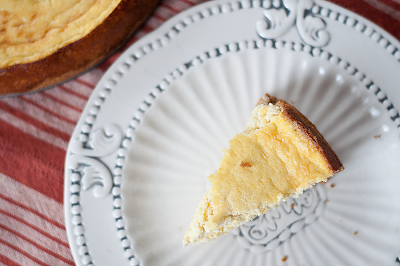 It's wonderful, and don't forget to add a little more Amaretto if you like. I did. Grease a 9-inch springform pan and set aside. Combine crumbs and butter, press into the bottom and sides of the springform pan. Chill crust for at least an hour. While crust is chilling, preheat oven to 350 degrees. Now, beat together ricotta and cream cheese until smooth. Add in remaining ingredients, beat until smooth again. Bake 60 minutes or until full in middle. Cool 20-30 minutes in pan, then remove to cool on a wire rack. Cool completely (I like putting it the fridge) before serving. this sounds so perfect! i love amaretto so much! Beautiful, love the amaretto, like you I love working with old recipes from my family, I just received a bunch of them from my Mom and Aunt. Great cheesecake!